The other day, I was playing around with GenServers and I needed to see the documentation for the handle_call hook. I knew that this wasn’t a function defined on the GenServer, So I couldn’t just do a h GenServer.callback. I thought to myself that there must be a way to get callback documentation using h, so I typed h h in IEx. Prints the documentation for IEx.Helpers. No documentation for function GenServer.handle_call was found, but there is a callback with the same name. You can view callback documentation with the b/1 helper. Aha! These are the little things which make me love Elixir so much :’) So, the next time you want to look up documentation about callbacks just use the b helper in IEx, hope that saves you some time :) It even accepts a module and shows you all the callbacks that a module defines! P.S: The curse of knowledge is real, if I hadn’t tried the naive way, I wouldn’t know that it was so easy to get documentation for callbacks and I would have ended up creating a GenServer, sending a message and inspecting the arguments to figure out what they were. So, the next time you run into a problem, it might be worth your while to take a step back and ask yourself, How would an Elixir beginner do this? is received (unless the call times out or nodes are disconnected). current state of the GenServer. continues the loop with new state new_state. milliseconds if no messages are received. leaves a continuous heap that minimises the memory used by the process. immediately after with the value continue as first argument. known before calling a slow function. • To reply from another process, such as a task. process exits without replying as the caller will be blocking awaiting a reply. occurs as with a :reply tuple. response to call and the process exits with reason reason. new_state} except a reply is not sent. call is performed against it. The code is pretty self explanatory, we get a list of all the files in our repo and then remove the ones which already have the magic string and then filter it to just the ruby files and finally adding the magic string to all the files. Solving Day 3 turned out to be a bit more challenging for me as I don’t usually do these kind of exercises, Nevertheless it was fun! assert File.read! ("input.txt") |> find_common_boxes == "pebjqsalrdnckzfihvtxysomg"
Day 1 had a simple challenge, compute the sum of a few numbers and find out when a prev frequency shows up again. This was a bit tricky as you may have to repeat the input multiple times to get the answer. To do this in elixir, we use simple recursion if we aren’t able to find a repeating frequency in the current iteration. Also, note that we are using a map to store previous frequencies, I have seen folks use a list which cause a huge impact on performance as lists don’t perform well for lookups whereas maps really shine in these scenarios. The Ruby implementation is similar to the Elixir implementation. Let us see a few possible ways to do this in Elixir! That is some real ugly code, it is exacerbated by the fact that Elixir doesn’t allow early returns. rem(n, 3) == 0 and rem(n, 5) == 0 -> "FizzBuzz"
rem(n, 3) == 0 -> "Fizz"
rem(n, 5) == 0 -> "Buzz"
This is a huge improvement, I really think this captures the problem the solution in a very readable way. divisible_by_3? (n) and divisible_by_5? (n) -> "FizzBuzz"
Using separate predicates improves the readability further. This is a concise chunk of code but isn’t as readable as the one that uses cond. def fb_fun(_, 0, 0), do: "FizzBuzz"
def fb_fun(_, 0, _), do: "Fizz"
def fb_fun(_, _, 0), do: "Buzz"
I think this is actually less readable than the one that uses case as the logic. def fb_fun2(n) when rem(n, 3) == 0 and rem(n, 5) == 0, do: "FizzBuzz"
def fb_fun2(n) when rem(n, 3) == 0, do: "Fizz"
def fb_fun2(n) when rem(n, 5) == 0, do: "Buzz"
This feels like an improvement to the previous implementation readability wise. def fb_fun3(n) when is_divisible_by_3(n) and is_divisible_by_5(n), do: "FizzBuzz"
def fb_fun3(n) when is_divisible_by_3(n), do: "Fizz"
def fb_fun3(n) when is_divisible_by_5(n), do: "Buzz"
I like this one a lot, it feels very terse and reads like a mathematical equation. Which version do you personally find more readable? I feel like the last one and the implementation using cond are the more readable versions. def fb_fun1(_, 0, 0), do: "FizzBuzz"
def fb_fun1(_, 0, _), do: "Fizz"
def fb_fun1(_, _, 0), do: "Buzz"
The first time I run this test it creates a file at fixture/vcr_cassettes/google_oauth_challenge.json. This contains the request and response data from this test. Now, whenever you rerun this test it just loads this request and response data and replays the response if the request matches the saved request. So, your tests will pass even when you don’t have network connectivity! You don’t want to haul around MBs of fixtures in your source control (you must check in the cassettes i.e. the fixture/ directory). Let ExVCR record the cassettes with all the large data. Download the same response from outside using curl. This fixes the slow tests and also reduces the size of cassettes. Once the above code is set, I can just jump into the console and start pushing messages to the channel and discover how it all works by poking it around. Elixir has :timer.sleep(ms), a function which allows you to pause a process’s execution for an arbitrary number of milliseconds. We can implement the same using messages and a timeout in the following ways. # create a unique ref, so that we don't stop on any random `:timeout` message. GitHub Pages has recently finished one of the long standing feature requests of allowing SSL on custom domains!. I have it enabled on my blog (https://minhajuddin.com). Yay! However, I have not been able to publish any new blog posts because the effort required to publish a new post is a bit too much! The previous service that I had used to auto publish was shut down. And looking at the alternatives, Travis CI looked great. I use it for a few of my other projects. # 4. Make sure Travis is configured to hide your Variable, else others will see your access token and can mess with all your repos. The project that I am currently working on has a huge data set of static lookup data. And, we have been using Redis to store this data since the beginning of the project. We figured, redis would be the fastest as the whole data is in memory. However, in our production use we have found redis to be the bottleneck. This is not really redis’ fault as the data access pattern that we have involves a huge number of lookups more than 10K lookups per request. Also, since redis runs on a single core, it isn’t able to use all the cores on our server. Add the network costs and the serialization costs to it and things add up very quickly. This led me to do some benchmarking of redis against ets with our actual production data and (un)surprisingly we found that ets beats Redis for simple key value data. So, if you are using redis as a key value store. Please do yourself a favor and use ets (If you are using Elixir or erlang). Go ahead and try it out by tweaking the count of records or the parallelism. We found that the ets to redis performance gap actually grows as the parallelism increases. I had to do some string stripping in one of my apps which was a bit performance sensitive. I ended up benching multiple approaches to see the speed differences. The results are not that suprising. You may disable this warning by passing print: [fast_warning: false] as configuration options. I tweaked the benchmark code a little to run each replace a 1000 times to remove the “too fast” warning. For reverse string removal from the end, replace_suffix is the fastest which makes sense. However, for removing the prefix, pattern_match_bytes seems to be the fastest. But, it isn’t really truly correct. Because in my instance, I know for sure that the prefix is present. So, the second best performance for which is pattern_match is 6x better than the current String.replace_prefix implementation. It may be because I am using OTP 20? I’ll run this on other versions of OTP to compare results. And, if the results are cosistent, will create PR on elixir to change the default implementation. Lists are the bread and butter of a functional language and Elixir is no different. Elixir uses linked lists to represent lists. Which means, if a list is n elements long it will take n dereferences to get to the last element of the list. This understanding is very important for writing efficient code in Elixir. Because of this adding to the head of a list is nearly instantaneous. Now, one thing to note is: if a previous variable has a reference to el1 it will still have a reference to the earlier 4 element list. So, we are not mutating/chaning the existing list/references. Now, if this list is referenced by a binding foo. And if we want to create a new list bar with a new element el5 at the end. We can’t just traverse the list, create a new node with value el5 and set a reference from el4 to el5. If we did that, the reference foo would also get a new element at the end. And this is not how Elixir/Erlang work. The BEAM does not allow mutation to existing data. So, to work within this framework, we have to create a brand new list containing a copy of all elements el1..el4 and a new node el5. That is why adding elements to the tail of a linked list is slow in Elixir. Because we end up copying the list and appending a new element. Pick the one where the first list has lesser elements. In this example that would be the A implementation. Note that this is an outrageous benchmark, no one is adding lists containing 10 million elements this way ;). But it demonstrates my point. I have been working with a lot of ETL stuff lately and have to import/export data from our postgresql database frequently. Here is a hacky way to do use multiline SQL with \COPY. When you open Google Chrome’s Network tab, you don’t see the traffic for websockets. 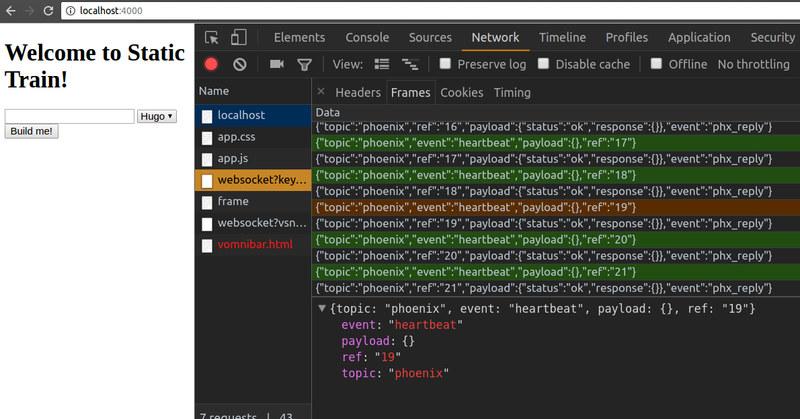 I spent quite some time trying to see the messages between my browser and the phoenix server. I was expecting to see a lot of rows in the network tab one for every message. However, since websockets don’t follow a request-response pattern. They are shown in a different tab. To see the messages sent on the websocket. Click on your Network tab and then click on the websocket request. This should show you a pane with a Frames tab. This Frames tab should show you all the messages that are being sent back and forth on the websocket.